In April of 2001, Dennis Tito became the first traveler to pay for a trip to space with money out of his own pocket. He decided to do it and then just did it. That's what tourism is all about. Since then six other "personal spaceflight participants" have traveled to the ISS. The trips were arranged by the company Space Adventures. Adventure tourism, such as trips to Antarctica or Mount Everest, has long been a profitable business. This can involve packages with prices as high as $100k range and even higher. Though you commonly hear talk of "space joyrides for the rich", the development of space tourism will follow the normal course of development seen for most all consumer technologies and services. Experience microgravity on a commercial parabolic flight. Before orbital rides are widely available, suborbital flights will be the most common way to ride into space. There are several companies currently planning suborbital space vehicles for tourism and other applications. 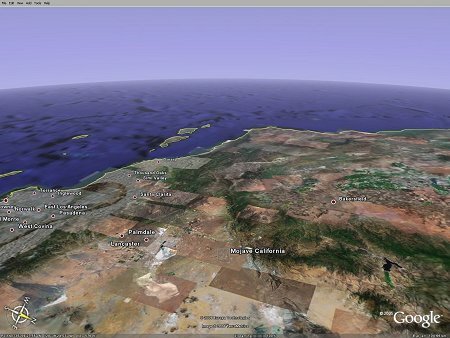 The typical plan is to got to around 100km where one can see the horizon out to 1000km or so and clearly see the curvature of the earth and the starry blackness of space. In October of 2004, Burt Rutan's SpaceShipOne won the X PRIZE and thereby started a new race to develop the first vehicle that will provide suborbital space rides to paying customers. Suborbital generally refers to an up-and-down ( i.e. mostly vertical) flight that reaches an altitude of around 100km or more but does not go into orbit around the earth. The billionaire Richard Branson in September 2004 announced a contract with Burt Rutan that gave him funding to design and build a passenger vehicle referred to as SpaceShipTwo (SS2). The goal for the SS2 was to fly safely and routinely above 100km for a cost of $250k per seat. The SS2 carries 6 passengers and 2 pilots. The initial goal of Virgin Galactic was to begin commercial flights well before 2010. However, development problems, particularly with the propulsion system, led to many postponements. Commercial flights were finally expected to start in 2015 but an accident in Oct. 2014 destroyed the SpaceShipTwo and killed the copilot. The accident was caused by a combination of pilot error and a poor design of the controls of the return system. Richard Branson, with the support from the 700+ people who have put deposits down for flights, decided to continue with the program. The newly built SpaceShipTwo Unity vehicle was rolled out in January 2016. It is to begin unpowered test flghts in 2016 and powered flights in 2017. If all goes well, commercial flights would start in 2018. Meanwhile, Blue Origin, the company founded by Jeff Bezos of Amazon.com fame, has continued step-by-step development of vertical takeoff and landing reusable rockets. As of July 2016, the New Shepard rocket vehicle has flown four times to over 100 km. The vehicle is a combination of a booster and crew capsule. 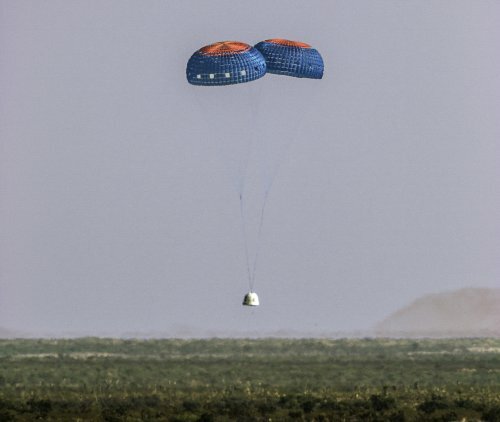 After the engine shuts down, the New Shepard capsule separates and a crew of up to 6 people will experience about 4 minutes of weightlessness as the capsule passes over the apogee of the flight. It will then enter the atmosphere and land by parachute. Meanwhile, the booster does a powered vertical landing. The first crewed flights are set for 2017. If all goes well with the test program, commercial flights with passengers will start in 2018. The ticket prices are expected to be initially in the $250k range. You can also train for spaceflight by experiencing microgravity in Russian plane flying parabolic trajectories. The company ZERO-G also offering such rides in the US for $5000 per person. The first 20 flights were already sold out before they began regular service. ZERO-G offers flights out of Las Vegas, Kennedy Space Center and other locales. If you can't pay for an orbital trip, perhaps you can win a ride. There are usually several contests going on at any particular time that offer the opportunity for the winner to go into space. When orbital flights become lower in price, there are companies designing space hotels where you can enjoy microgravity sports and astonishing views of earth. The company Bigelow Aerospace has launched two prototypes of its inflatable space habitat. Another module called BEAM was attached to the International Space Station in 2016. The company currently hopes to launch a BA-330 module (330 cubic meters volume) to the ISS in the 2020 and later in the 2020s create a free-flyer station comprized of two or more BA-330s. SpaceX and Boeing would provide commercial transport to the station. See Opportunities and Pricing - Bigelow Aerospace (Spring 2013). See this slide presentation by Sam Coniglio at the Space Tourism Society for a nice overview of the possibilities for future space tourism. If you would like to travel in space in spirit only, then send a token of yourself, e.g. your name or DNA sample, on a space probe. The company Space Adventures and other companies offer rides on high performance jets such as the MIG-25, which can go to 25km in altitude. See also the section on Astronomy Tourism that involves trips to see eclipses, Aurora and other astronomical phenomena. Lunar tourism: Deep Space Expedition from Space Adventures and the Lunar and L2 Exploration Missions from Excalibur Almaz each involve sending two people around the Moon (ala Apollo 8) on modified Russian spacecraft for ticket prices in the $100M range. Orbital Tourism: Seven tourists so far have ridden Soyuz spacecraft to the International Space Station for one week stays and more are waiting to go at a ticket price in the $30M range. (One person, Charles Simony, has flown twice.) Bigelow Aerospace is building a new generation of space habitats based on light-weight, high-volume inflatable designs. They are intended to serve as both scientific stations and space tourist destinations within the next decade. 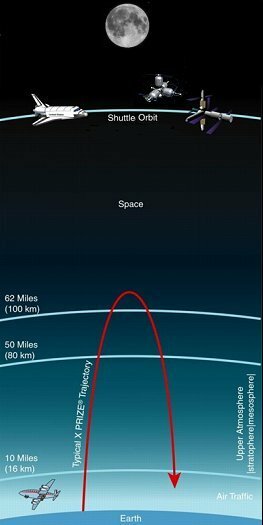 Suborbital tourism: At least two companies are expected to begin selling rides in the 2013-2014 time frame on spaceships that will fly the X PRIZE style trajectory to 100 km or higher. This will provide around 5 minutes of weightlessness, a view of the curvature of the earth and a dark star-filled sky. Ticket prices are in the $100k to $200k range. High altitude jet flights - Ride a MIG 25 to 36 km. Ticket price is $24k. Weightlessness on aircraft flying parabolic trajectories. Weightless periods last 25 - 30 seconds. Tickets in the US are currently ~$5000 range. Spaceflight Training programs: Prepare for suborbital and orbital spaceflights via training programs that use centrifuges and other systems to simulate a mission to space. Notes by Andy Janes from the one day symposium in London on June 30th, 2009, sponsored by the Royal Aeronautical Society. SpaceFuture - frequent news updates on space tourism. Dennis Tito signals a successful flight. Dennis Tito became earth's first space tourist. 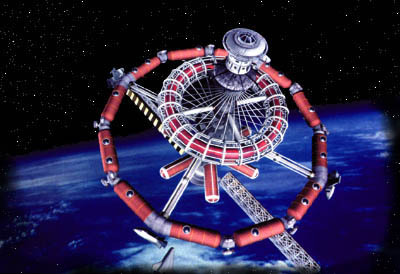 His ride to the space station was arranged by Space Adventures, described below. Space Adventures and several other companies are also offering reservations on future sub-orbital flights and also on MIGs and aircraft flying parabolic trajectories to provide periods of microgravity. Jeff Bezos, founder and CEO of Amazon.com, created Blue Origin in the year 2000 and the company has slowly but methodically moved forward towards reusable rocket vehicles for human spaceflight. In November of 2015, an unmanned New Shepard vehicle flew to above 100 km. As of July 2016, the same vehicle has flown to space three more times. The vehicle consists of a vertical takeoff and landing reusable rocket booster and a crew capsule with large windows that can carry up to 6 people. When the engine shuts off, the crew capsule separates from the booster and returns for a parachute landing. At apogee there are about 4 minutes of weightlessness. 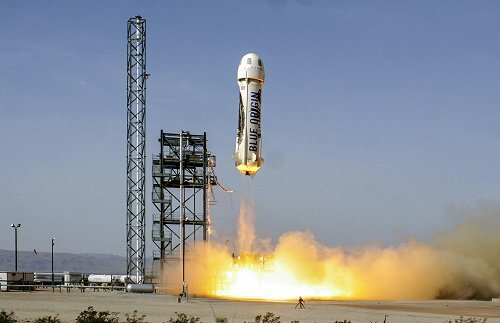 Tests will continue into 2017 when the first Blue Origin employees will ride the New Shepard. If all goes well, commercial flights will begin in 2018. Tickets are expected to start out in the $250k range. Richard Branson contracted with Burt Rutan's Scaled Composites company in 2004 to develop a vehicle called the SpaceShipTwo based on the SpaceShipOne technology. It will carry at least six passengers and two pilots to more than 100km latitude. The initial goal was to begin test flights in 2008 and passenger operations in 2009 but various technical problems caused repeated delays. The first power test flights began 2013. Commercial flights were to start in 2015 but an accident in Oct. 2014 destroyed the SpaceShipTwo and killed the copilot. The accident was caused by a combination of pilot error and a poor design of the controls of the feather return system. Richard Branson decided to continue with the program and the newly built SpaceShipTwo Unity vehicle was rolled out in January 2016. It is to begin unpowered test flghts later in 2016 and powered flights in 2017. If all goes well, commercial flights would start in 2018. The SpaceShipTwo is built by The SpaceShip Company, a wholely owned subsidiary of VG. Scaled Composites is no longer involved in the vehicle construction. The initial ticket price was $200k but was increased to $250k in 2013. As of February 2014, the company has collected around 700 people signed up for flights. Space Adventures is a full service space tourism agency. It offers everything from Space Shuttle launch tours to Soyuz flights to the Space Station. The company helped arrange Dennis Tito's flight to the ISS as well as the subsequent private visitors to the ISS. See below for information on the "spaceflight participants" who have gone to the ISS with the help of Space Adventures. SA has several former astronauts on its advisory board, including Buzz Aldrin. SA will arrange for you to take a MIG ride to 25km in altitude or experience micro-gravity in a Russian plane flying parabolic trajectories. It also offers reservations on sub-orbital flights when they become available in a few years. The pricing is around $100k. Space Adventures has said in the past that about 100 people have either placed deposits of a few thousand dollars or paid the full amount. Deep Space Expeditions (DSE) - details of the $200M trip to the Moon. XCOR Aerospace is developing the Lynx rocketships for flights to over 100km. The vehicle holds a pilot and one passgner and test flights were to begin in 2016 but the company suspended development of the Lynx to focus on near term money making projects. The Lynx Mark Iwas to be the initial prototype and it would go to 60km. The Mark II version would be the production vehicle that goes to 100 km. begins to fly passengers in the 2014-2015 time frame. The price for a flight is 0around$95,000. Incredible Adventures offers several space related experiences in addition to safaris and stock car racing. Like Space Adventures, they will eventually offer suborbital rices but in the meantime, they offer Mig-25 flights to 27 kms in altitude and Zero-gravity parabolic flights in Russia. Also, at Star City in Moscow you can undergo Cosmonaut training. An added option is training in the Hydrolab water tank that simulates EVAs. The Deep Space Expedition from Space Adventures and the Lunar Express Mission from Constellations Services each involve sending two people around the Moon (ala Apollo 8) on modified Soyuz spacecraft. Ticket prices would be in the $100M range. "Elegant Resorts is the only Virgin Galactic Accredited Space Agent in the UK"
Pure Galactic - British space tourism company. SpaceWander Virtual Space Trip! - this adventure and space tourism travel site also offers a cool interactive multimedia trip from earth to Mars. Wildwings is a UK based travel company that offers various adventure tours, such as trips to Anarctic. It is now developing a space tours package. WildWings is the UK Sales Agents for Space Adventures Inc. (see above) and is taking deposits on suborbital flights. WhereInTheWorld - Final Frontier - this adventure tourist company will reserve you on a sub-orbital flight, Space Camp, Shuttle launch and more. Anousheh Ansari became the fourth person to pay for a flight to the ISS. Space Tourists | A Film by Christian Frei. Also referred to as space tourists, citizen explorers, and public spaceflight participants, I like to use astourists and astournauts for space travelers who pay for a trip to space with their own money rather than with government funds. Note that in this section the focus is on orbital spaceflight, particularly trips to the Moon. Suborbital spaceflight is discussed below. See the above News headlines and the tourism news archive for links to many older articles about the ISS visitors and other space tourism related topics. "Very Stunning, Very Space, and Very Cool" : The launch of space tourism - Technology Today - January/February 2009. (Single page version) - extended composite interviews with Shuttleworth, Olsen, Ansari, Simonyi, & Garriott. During his 12-day stay at the ISS, Mr. Laliberté will share information about water issues in the world through a singular poetic approach. The messages he transmits will raise awareness for ONE DROP Foundation initiatives that promote Water for all, all for water. Simonyi will take a second trip to the ISS in March 2009. His first trip took place in April 2007. Traveled to the ISS in October 2008. He planned a wide range of activities in education, commercial microgravity experiments and in other areas. He is a well known computer game developer (see bio at Wikipedia) and is the son of former NASA astronaut Owen Garriott. He has also been a long time board member of Space Adventures. "Our Space - where space becomes personal. Richard Garriott - computer games guru, adventurer and astronaut - visited the International Space Station in 2008. Now Richard is sharing some of his amazing experiences with you through the videos on this website. You can explore the clips, find extra facts, images and explanations, and download the material to use in lessons and projects. ....Now space can be your adventure too." Space Tourist, Station Cosmonauts Land Safely - space.com - Oct.24.08 - "There's no question I'm already starting to think about the next trip up". "To be frank this price tag is the majority of my wealth, to be honest," Garriott said Wednesday at a NASA briefing in Houston. "The reason why it's worth that to me is that this is the goal I've been working toward for a significant portion of my adult life." Anousheh Ansari - provided crucial financial support for the X PRIZE competition. She is in training for a flight to the ISS. X-Prize's Ansari aims for the ISS - NasaSpaceFlight.com - Mar.16.06. Flew to the International Space Station April 28 - May. 6,2001 - first person to pay his own way into space. The payment is often reported as $20M but has been rumored to be as low as $12M. Flew to Mir May 18-26, 1991 - a chemist who entered a competition with 13000 applications for a flight sponsored by several UK companies to send a British citizen to Mir. After 18 months of training with 3 other finalists, she was selected as the one to go to space. She carried out some experiments (one of the candidate requirements was a scientific background) during her week long stay but she was basically a guest there. The company sponsoring the project failed to raise the promised funding but the Soviet government decided to continue with the project for the public relations benefits. Akiyama was certainly the first journalist to fly in space. The Tokyo Broadcasting Service (TBS) in 1989 wanted to celebrate its 40th anniversary and decided that sending one of its reporters into space would be suitably spectacular. Akiyama came out on top from the 163 candidates. TBS paid $12 million ($4 million of which was covered by sponsorships) for the trip. Akiyama was sick the first 3 days but was fine for the rest of the week long stay. (A chain smoker, going cold turkey for a week must have added extra pressure on his system!) He took many pictures of Mir and of earth and carried out a couple of scientific experiments. He also sent live broadcasts each day to Japan. This South Africa millionaire flew to the ISS in 2002. Made his fortune after founding and selling an Internet based company. His flight payment was more like $14M rather than the often quoted $20M. This Russian businessman came very close to flying to the ISS but the Russian Space agency would not agree to the price he was willing to pay. The former head of the National Space Society nearly had a flight to the ISS arranged via the sponsorship of several corporations. But the Astro Mom's mission fell through when it conflicted with Lance Bass's efforts to go. This buinessman was said to have lost interest when he was apalled by the intense publicity when rumours of his mission began to surface. It is well known that the director of the movie Titanic has been trying to arrange a trip to the Space Station. However, he wants to carry out an extensive film project that includes a spacewalk for himself. This involves far more training and use of the station facilities and crew time than the other space tourists. While he would pay for the trip, this will be more of joint NASA/Cameron documentary production than a space tourist trip and will take a long time to arrange if ever. The former member of the NSync group got the most attention in the general press, especially the part aimed towards young people, of any of the orbital space tourist candidates. Unfortunately, Bass's flight fell through when his complicated sponsorship arrangement never got off the ground. Plus the Shuttle Columbia accident put a hold on private passenger flights on the Soyuz for a couple of years. A review of the challenges facing the ISS space tourists, written by a lawyer at the firm that represented the first three ISS tourists. Reviews attempts previous to Bass to use sponsorships and movie profits to pay for a Soyuz trip to Mir and the ISS. The view from 100km above Mojave California as displayed by Google Earth. 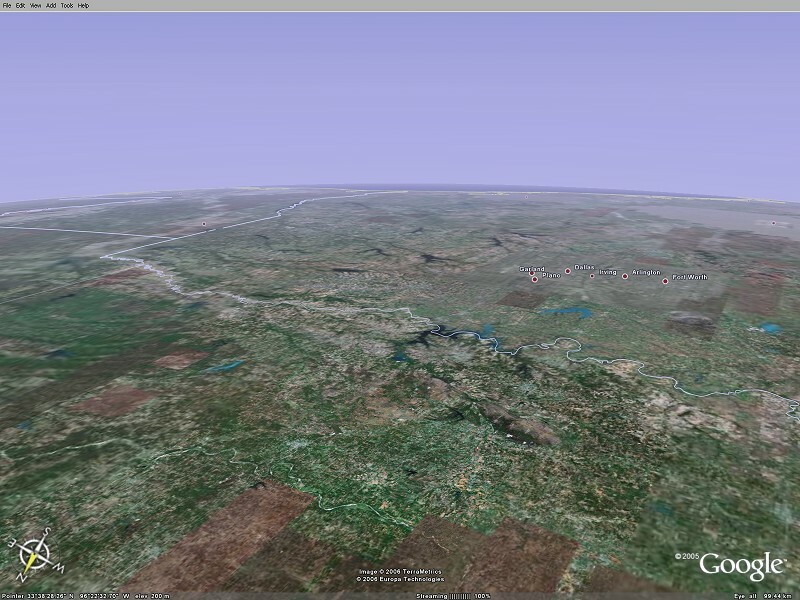 See also the view above Oklahoma at 100km. With the cost to orbit expected to remain extremely high for many years, the next best option is to take a brief trip into space on a suborbital resuable rocket vehicle. Now that Burt Rutan's SpaceShipOne has won the $10 million X Prize contest, the race is on to become the first company to provide routine flights to altitudes above 100km for space thrill seekers. Though such rides would be relatively short, 15-30 minutes for the rocket powered segment and the unpowered ascent and reentry, riders would nevertheless enjoy one of the most amazing and thrilling experiences of their lives. They would experience a few minutes of weightlessness, look down on a clear view of the curvature of the earth, and see bright stars in a black canopy above. One would also get the accelerating thrill of riding a rocket . The question obviously arises as to how many people would pay for such a ride, especially if the cost is $100k to $200k. Surveys, in fact, shows considerable interest among a sample of wealthy people. For more info, see the Space Tourism Markets section. Space Adventures - no vehicle has been specified by the company. HT - horizontal takeoff, HL - Horizontal landing. Space Adventures offers a sub-orbital package in the $100,000 range. Over 100 people have placed deposits for the trips whenever a suitable vehicle becomes available. RLV Countdown - links to various companies trying to develop high altitude sub-orbital vehicles. RLV Table - status and comparison of several sub-orbital vehicle projects. The article Be Your Own Astronaut (If Bob Truax Gets His Way) - by Paul Siegler - L5 News Vol. 3 Num. 4 April 1978 (pdf 1.1MB) describes Project Private Enterprise that sought to build the reusable Volks-Rocket for $1 million. After the success of the SpaceShipOne and the subsequent promise by Virgin Galactic and other companies to create a space tourism industry, companies around the world began to sponsor promotional contests in which a suborbital spaceflight was the grand prize. Here are some of the current and completed contests and promotional programs. A video about the Space Needle/Space Race 2012 contest. two lucky winners will be drawn for a trip to space aboard the XCOR Aerospace Lynx Vehicle, including space flight training. Spot3008 Crossover Peugeot - Win a once in a lifetime SPACE TICKET! Red Gate Software has teamed up with Space Adventures to offer one lucky DBA a ticket into space. Complete our video quiz, and you could be the winner. Aside from the grand prize, there’s a discount on Red Gate tools available for anyone who enters, rewards for the finalists, and a free eBook for everyone who takes part in the voting. Virgin Blue Airlines in Australia in which new frequent flyer points will be matched by entries in a drawing to win 25 Million points. This many points can be redeemed for four major prizes including a ride on SpaceShipTwo. First prize is a flight on ZERO-G parabolic aircraft. Equivalent worth of $80,000 USD. The flight will be arranged by Space Adventures. Space Adventures will arrange the flight. Vanishing Point - A contest sponsored by AMD and Microsoft to promote the new Vista operating system. The grand prize was a suborbital spacefligt. The contest was completed and the prize awarded. Quirk Books and Space Adventures sponsored a sweepstakes that will give away a ticket on a commercial space flight as the grand prize. The contest is part of the promotion for Eric Anderson's new book called The Space Tourist's Handbook, which will be released in November. Guinness includes a space tourism prize as part of its 250 year anniversary celebration. Buzz Aldrin Announces that the only way to go is up with the diet 7up free ticket to space sweepstakes - 7UP/Space Race News! - May.25.05. 7 UP to Offer Free Space Flight - X PRIZE Space Race News! - Oct.4.04 - details of the 7-Up contest will be released in 2005. Voyage2Space.com - UK based pay to play competition, i.e. a raffle, for a ride on a SpaceShip Two. Online skill game offers the chance to win a spaceflight on the RocketPlane XP. "Find the 10 Planets, and win a Holiday in Space". A treasure hunt game in which the grand prize is a trip to space on a suborbital rocket ship. This game is free to play with no registration. Virgin Galactic Quest - "The ONLY Out of this World Experience"
There are insurance companies that sell so-called "hole-in-one policies" that pay off if someone hits a hole-in-one at such a tournament. The companies know the odds for hitting hole-in-ones so they calculate the premiums such that over many such tournaments they come out ahead. The purse for the X Prize, in fact, was funded via a "hole-in-one" policy in which the insurance company essentially bet against any team winning the competition before the deadline. eSpaceTickets.com now offers a package of resources that make it easy for an organizations to hold such tournaments with a space prize theme. Some of these programs have folded or become inactive but are still interesting from an historical perspective in regards to how space tourism developed during this period. Win a flight on SpaceShipTwo - The Royal Aeronautical Society - RAS members can enter this contest to win a flight on SS2. GameTrust.com, an online game company, is sponsoring a contest in which the winner will take a MIG 25 ride arranged by Space Adventures. To participant in the contest you must join its affiliate advertising program. Adeo Ressi, CEO of GameTrust, is on the X PRIZE Foundation Board of Trustees. A currently inactive program by Bristol Spaceplanes, which is developing the Ascender, suborbital spaceplane. New members of the Ascender Club become eligible for a drawing to win a free ride on the Ascender. eSpaceLotto - an earlier project of Tony Webb that ended after the Columbia accident. The eSpaceTickets.com program became the focus of his space tourism efforts. Tour2Space offers this space tourism sweepstakes ("no purchase necessary"). Purchase of products from their affiliate advertisers allows you to enter the contest. Trans Lunar Orbital Vacation Raffle - Trans Lunar Research is a non-profit organisation aiming to "set up the first manned Lunar Station on the surface of the Moon." They hope to bootstrap their efforts with a raffle that will fund their work. Dole's Win a Trip to Outer Space Contest - This contest was won by a retired man who decided to take $50k in cash instead of waiting for the trip to space. This contest offered the winner a $98,000 trip on Space Adventure's space cruiser (formerly the Zegrahm Space Voyage program) that would fly a suborbital flight sometime in this decade). BuyMeToTheStars.com - Don't Let Gravity Get You Down! There have been several announcements over the past few years for TV contests in which the winner would go to Mir or, after Mir died, to the International Space Station. These usually followed some sort of Survivor style reality show competition format in which several contestants would compete for the seat on a Soyuz. So far, these programs have not made it to the screen and seem to be defunct. Some are said to still be in development but no hard info is available. The reality space race - The Space Review - June.21.04 - Dwayne Day argues that suborbital spaceflight will make space-themed reality shows a reality, not orbital ones. A project involving European Space Agency, European Broadcasting Union and, French broadcasting company, Label-Anim. A winner from a group of applicants from EU countries will go to the ISS. Runner-up will get a suborbital flight. Space cadets taken in by TV hoax - BBC - Dec.17.05. This project actually involved the producers of the original Survivor TV program. They signed a contract with MirCorp for a group of contestants to go through Cosmonaut training. The candidate that came out on top would have gone on a week long trip to the Mir space station. The project changed names to Destination Space after Mir deorbited and the destination moved to the ISS. According to articles at MSNBC, the project is still in development. However, the website has now disappeared. The German Brainpool AG group announced this contest that would send a winner each year to the International Space Station. They reportedly wanted to reserve 7 slots on Russian Soyuz rockets; one for each year of the program. However, the web page no longer responds and nothing turns up in a search at Brainpool so probably the project has either died or returned to a longer term development stage. MirCorp signed a deal in 2001 with Image World Media to reserve a seat on each of two Soyuz flights in 2003. The Asia based company wanted to use the seats to fly the winners of survivor games shows to the ISS. TV 2 - Den store mission (The Big Mission) - a Danish TV contest that was to award contestants the opportunity to ride on a sub-orbital flight when they become available. Otherwise, they could take a monetary prize. Don't know if any prizes were ever awarded. Here is an interesting interview with a former Shuttle astronaut who competed in a non-space reality show: Interview: Astronaut 'Survivor' Dan Barry - collectSPACE - Mar.13.06. * Space Adventures has reported numbers in this range for those who are in training for Soyuz flights or expressing strong interest in a flight.